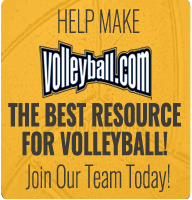 Volleyball.Com - Get the latest news and list of camps and clubs. Check out the official indoor and outdoor volleyball rules! Also find out what each signal means, learn the correct scoring procedures, check out an example roster sheet and line up sheet and the correct measurements for a volleyball court! Looking for drills to improve your spiking, passing or setting? Or are you looking for a way to transition throughout the court or place that perfect serve? 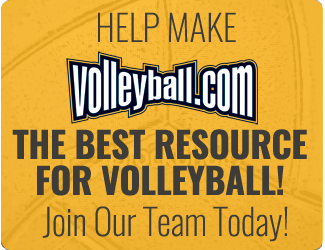 We have numerous volleyball drills that can help you in all of your volleyball skills! Coaching a team and need some ideas for drills? There are several drills listed that will keep the younger athletes engaged while working on developing their skills. Looking for exercises and stretches to help avoid injuries? Recently hurt while out on the court? Check out our Sports Injuries page where you will find stretches to help prevent injuries, some at home remedies and suggestions by physical therapists! The Tachikara Composite Volleyball - Sensi-Tec SV-5WSC, Colored is what you need if youre looking for high quality ball for practice, competition, or even for fun and casual games. This volleyball features the Sensi-Tec construction which provides superior softness and ensured durability while the 2- and 3-color combinations allow increased visibility. For amazing ball flight, it is constructed with the patented loose bladder for maximum air and shape retention as well as superb ball flight and control. Whats more, it is available in 52 different colors and comes with a 1 year limited warranty as well. So what are you waiting for? Enhance your skills and buy the Tachikara Composite Volleyball - Sensi-Tec SV-5WSC, Colored today!